This unfinished work offers a rare glimpse in the early stages of the painting process. 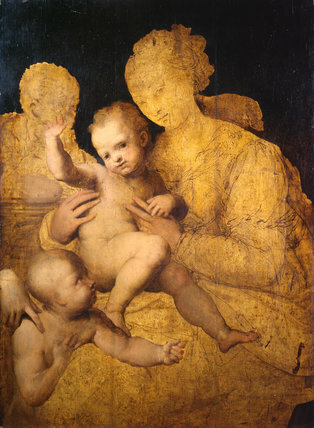 The children’s bodies and the adults’ hands were modelled thinly in paint. 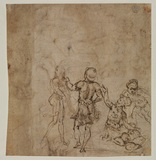 In the rest of the composition, two types of underdrawing are visible. Mary’s features were traced from a cartoon, but her exuberant drapery was drawn freehand with a fine brush. Perino del Vaga was a member of Raphael’s workshop and became the leading painter in Rome. However, this painting was probably executed during his decade-long stay in Genoa.